I had found this record years ago and played it once, quickly forgetting about it. Recently, I spun it again and was captivated. 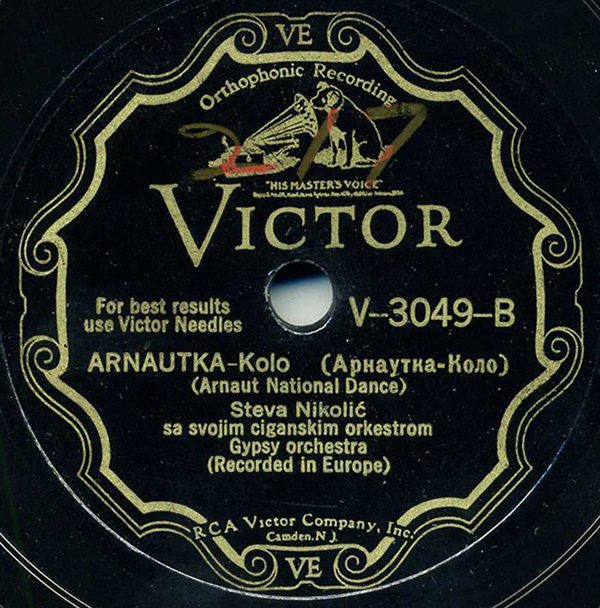 Recorded in December of 1927 in Belgrade, Serbia (then Yugoslavia), Steva Nikolič’s brilliant violin playing and the murky, sonorous backup accompaniment are haunting in a way that other “gypsy orchestra” records are not, in my listening experience. “Gypsy” music – music of the persecuted Roma people – is varied. This piece sounds similar to Hungarian Roma/gypsy music from the same period, but is a far cry from the music of the Roma in Spain, flamenco. Wow, what a gorgeous bit of music! I’m such a sucker for violins. As a historian, I love the little tidbits from the past that you sprinkle into your posts. As a listener, I enjoy the vast sonic diversity you bring us. Please keep it up! Jonathan you continue to do marvellous work! A small contribution to info on this post: the technique of tuning two fiddle strings in octaves and running them in the same groove of the nut to be able to play continuously i parallel octaves is called çifteteli (dhiplohordho in Greek)(double/paired strings) which has subsequently given its name to the common term for ‘belly dance’. So this is one more example of the continuity of Ottoman traditions in the Balkans. Thank you for all the comments, I very much appreciate it. Tony: so glad you brought this up, thank you! Indeed, the fiddle string tuning is something that I wanted to mention, but was hoping someone with musician’s knowledge could jump in. Of course, I instantly recognized the tunings as being so familiar from my Turkish çifteteli 78s by people such as Kemani Recep and others. A beautiful sound! Oh yes!! thanks for this wonderful piece of music. I’m new here too, and hope to be burning up some more time here soon. This record is truly heartbreaking, one of my favorites so far – are there many reissues of this kind of early Gypsy music? There are many recordings of “gypsy” music from Hungary and elsewhere, but not from Serbia. Check my Resources page, but I don’t think there’s much, if anything. I also recommend checking out the blog Tamburitza and More as he might have another record or two posted from these Belgrade sessions.